James Madison (March 16, 1751 – June 28, 1836) was one of the principal framers of the U.S. Constitution, a Virginia representative to Congress, secretary of state in the administration of Thomas Jefferson, and fourth president of the United States. Sometimes called the Father of the Constitution, Madison played a leading role as an organizer, delegate, and chronicler of the 1787 Constitutional Convention. He was an influential advocate for the adoption of the Constitution by the states and the most forceful proponent of including a Bill of Rights in the new federal charter. Madison, with Alexander Hamilton and John Jay, authored the Federalist Papers (1788), a series of eighty-five essays on government that defended the proposed Constitution based on political theory, historical precedent, and specific factors relating to the newly independent United States. The Constitution, as drafted, did not enumerate specific civil rights but instead narrowly defined the powers of the government. Opponents of a Bill of Rights, particularly Hamilton, worried that naming specific rights would imply that no other rights than those enumerated would be protected by government. Following the ratification of the Constitution, Madison introduced ten amendments guaranteeing various freedoms—among them freedoms of the press, speech, assembly, and religion—in the first Congress in 1789, which were ratified and adopted as the Bill of Rights in 1791. A political ally of Jefferson and an increasingly partisan opponent of Hamilton and the Federalists, Madison helped found the Democratic-Republican Party (later the Democratic Party) in the mid-1790s and built a system of grass-roots political activism that led to the election of Jefferson in the "Revolution of 1800." Madison was a rationalist in religious matters and supported religious tolerance, yet warned about the entanglement of church and state. Like George Washington, John Adams, and Jefferson before him, Madison insisted that political freedom presupposed public morality. "To suppose that any form of government will secure liberty or happiness without any virtue in the people," he said, "is a chimerical idea." Madison served two terms as president, yet was by temperament less suited to the demands of executive authority than those of legislative debate. He declared war on Britain in the War of 1812, suffered the humiliation of the occupation of the nation's capital and the burning of the White House by British forces, and left office with a diminished reputation. In retirement, Madison helped Jefferson in the founding of the University of Virginia, but distanced himself from Jeffersonian principles of states rights over federal authority. In a note found after his death in 1836, Madison stated, "The advice nearest to my heart and deepest in my convictions is that the Union of the States be cherished and perpetuated." Madison was born in Port Conway, Virginia, on March 16, 1751. He was the eldest of twelve children and only seven of them would reach adulthood. His parents, Colonel James Madison, Sr. and Eleanor Rose "Nellie" Conway, were slave owners and the prosperous owners of a tobacco plantation in Orange County, Virginia, where Madison spent most of his childhood years. He was raised Episcopalian. Madison's plantation life was made possible by his paternal great-great-grandfather, James Madison, who utilized Virginia's headright system to import many indentured servants, thereby allowing him to accumulate a large tract of land. Madison, like his forebears, owned slaves. In 1769, Madison left the plantation to attend the College of New Jersey, finishing its four-year course in two years, but exhausting himself from overwork in the process. When he regained his health, he served in the state legislature and became known as a protégé of Thomas Jefferson. In this capacity, he became a prominent figure in Virginia state politics, helping to draft their declaration of religious freedom and persuading Virginia to give their northwestern territories (consisting of most of modern-day Ohio, Indiana, and Illinois) to the Continental Congress. As a delegate to the Continental Congress, he was considered a legislative workhorse and a master of parliamentary detail. Back in the state legislature he welcomed peace, but soon became alarmed at the fragility of the Confederation. He was a strong advocate of a new constitution and played a leading role in drafting and negotiating the main points at the Constitutional Convention in Philadelphia, in 1787. To aid the push for quick ratification, he joined with Alexander Hamilton and John Jay to write The Federalist Papers. Back in Virginia in 1788, he led the fight for ratification of the Constitution at the state's convention—oratorically dueling Patrick Henry and others who sought revisions to the constitution before its ratification. Madison is often referred to as the "Father of the Constitution" for his role in its drafting and ratification. However, Madison protested this designation as being "a credit to which I have no claim… The Constitution was not, like the fabled Goddess of Wisdom, the offspring of a single brain. It ought to be regarded as the work of many heads and many hands." When the Constitution was ratified, Madison was elected to the United States House of Representatives from his home state of Virginia and served from the First Congress through the Fourth Congress. With Jefferson he was the co-founder of the Democratic-Republican Party during his final term in the House. On June 8, 1789, he successfully offered twelve proposed amendments to the Constitution. Based upon earlier work by George Mason, the final ten of these rights became what is collectively known as the Bill of Rights by December 15, 1791. An eleventh of the amendments was belatedly ratified more than two centuries later and is today the 27th Amendment. The chief characteristic of Madison's time in Congress was his desire to limit the power of the federal government. During this time, the debate between Hamilton and Jefferson led to the formation of the first political parties in U.S. history. Members of the Federalist Party followed Hamilton and believed in a strong central government. 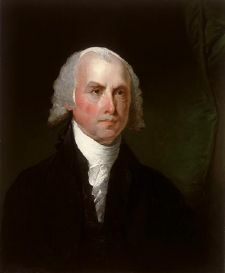 Madison was instrumental in the creation of the Democratic-Republican Party, which opposed the Hamiltonians as centralizing, pro-British elitists who would undermine republican values. Madison led the unsuccessful attempt to block Hamilton's proposed Bank of the United States, arguing the new Constitution did not explicitly allow the federal government to form a bank. In 1794, Madison married Dolley Payne Madison. It is Dolley who is largely credited with inventing the role of "First Lady" as political ally to the president. In 1797, Madison left Congress; in 1798, he and Jefferson secretly wrote the Kentucky and Virginia Resolutions, which insisted that states could block unconstitutional federal laws and became the basis of States rights arguments until 1861. Most biographers see a sea-change with Madison moving from strong nationalism in 1787-88 to a states' rights position that became extreme in the resolutions of 1798. Other scholars, notably Lance Banning, see more continuity, arguing Madison was never caught up in Hamilton's dream of a powerful nation. The main challenge Madison faced during the Jefferson Administration was navigating between the two great empires of Britain and France, which were almost constantly at war. The first great triumph was the Louisiana Purchase in 1803, made possible when Napoleon realized he could not defend that vast territory, and it was to France's advantage that Britain did not seize it. He and Thomas Jefferson reversed party policy to negotiate and win Congressional approval for the Purchase. Madison tried to maintain neutrality, but at the same time insisted on the legal rights of the U.S. under international law. Neither London nor Paris showed much respect, however. Madison and Jefferson decided on an embargo to punish Britain, which meant forbidding all Americans to trade with any foreign nation. The embargo failed as foreign policy and instead caused massive hardships in the northeastern seaboard, which depended on foreign trade. The Democratic-Republican Congressional Caucus chose presidential candidates for the party, and Madison was chosen in the election of 1808, easily defeating Charles Cotesworth Pinckney. British provocation continued, particularly the practice of using the Royal Navy to intercept unarmed American merchant ships and draft all sailors who might be British subjects for service in the British navy. Madison's protests were ignored, so he helped stir up public opinion in the west and south for war. One argument was that an American invasion of Canada would be easy and would be a good bargaining chip. Madison carefully prepared public opinion for what everyone at the time called "Mr. Madison's War," but much less time and money was spent building up the army, navy, forts, or state militias. After Congress declared war, Madison was re-elected President over DeWitt Clinton but by a smaller margin than in 1808. In the ensuing War of 1812, the British won numerous victories, including the capture of Detroit after the American general surrendered to a small force without a fight, and occupation of Washington, D.C., forcing Madison to flee the city and watch atop a hill in Virginia as the White House was set on fire by British troops. The British also armed American Indians in the West, most notably followers of Tecumseh. Finally, a standoff was reached on the Canadian border. The Americans built warships on the Great Lakes faster than the British and gained the upper hand. At sea, the British blockaded the entire coastline, cutting off both foreign trade and domestic trade between ports. After the defeat of Napoleon, both the British and Americans were exhausted, the causes of the war had been forgotten, and it was time for peace. New England Federalists, however, set up a defeatist Hartford Convention that discussed secession. In 1814, the Treaty of Ghent ended the war. The treaty nullified any territorial gains on either side, returning the countries to status quo ante bellum. The Battle of New Orleans, in which Andrew Jackson defeated the British regulars, was fought 15 days after the treaty was signed but before it was finalized. With peace finally established, America was swept by a sense of euphoria and national achievement in finally securing full independence from Britain. The Federalists fell apart and eventually disappeared from politics, as an Era of Good Feeling emerged with a much lower level of political fear and vituperation. "Having considered the bill…I am constrained by the insuperable difficulty I feel in reconciling this bill with the Constitution of the United States… The legislative powers vested in Congress are specified…in the…Constitution, and it does not appear that the power proposed to be exercised by the bill is among the enumerated powers…"
"Such a view of the Constitution would have the effect of giving to Congress a general power of legislation instead of the defined and limited one hitherto understood to belong to them, the terms 'common defense and general welfare' embracing every object and act within the purview of a legislative trust." Madison would support internal improvement schemes only through constitutional amendment; but he urged a variety of measures that he felt were "best executed under the national authority," including federal support for roads and canals that would "bind more closely together the various parts of our extended confederacy." After leaving office, Madison retired to Montpelier, his tobacco plantation in Virginia, which was not far from Jefferson's Monticello. He engaged in extensive correspondence on political affairs and served on the Board of Visitors of the University of Virginia for 17 years. Upon the death of Thomas Jefferson in 1826, Madison became the Rector of the University of Virginia and served for the next 10 years until his own death. This occurred on June 28, 1836, from rheumatism and heart failure. He left no children and was the last founding father to die. His detailed notes on the Constitutional Convention were published a few years after his death. Brant, Irving. James Madison. Indianapolis: Bobbs-Merrill, 1941-61. Channing, Edward. The Jeffersonian System: 1801-1811. New York: Greenwood Press, 1969. Hunt, Gaillard, ed. The Writings of James Madison. New York: G. P. Putnam’s Sons, 1900-10. Hutchinson, William T., et al., eds. The Papers of James Madison Chicago: University of Chicago Press, 1962-1991. Sheehan, Colleen. "Madison V. Hamilton: The Battle Over Republicanism And The Role Of Public Opinion." American Political Science Review. 2004 98(3): pp.405-424. Smelser, Marshall. The Democratic Republic 1801-1815. New York: Harper & Row, 1968. James Madison Biography and Fact File. Quotations by James Madison at Liberty-Tree.ca. The James Madison Papers, 1723-1836 from the Manuscript Division at the Library of Congress, approximately 12,000 items captured in some 72,000 digital images. The Papers of James Madison from the Avalon Project. This page was last modified on 18 March 2018, at 20:53.